And for people with real jobs . . . Living life in "ish" time would be a dramatically different lifestyle. I can't decide if it would be better, worse, or both. 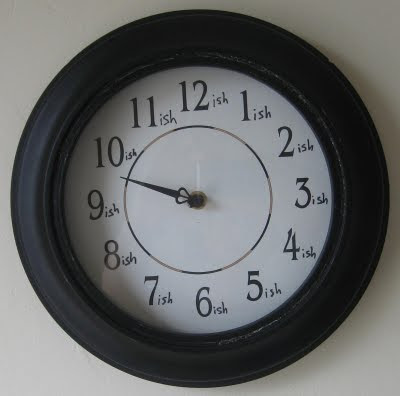 Great idea for a novelty Clock design, i am always saying the time is about Xish o'clock, this would justify my comments. Great design. Super amazing. Love it! I like the story. Yeah, maybe it will be a great travel thing to bring. Thanks for posting that great clock with us. I must say you're creative. I can read that clock also without my glasses. Spendish! You know that this clock is the perfect commentary on my info theory piece about the entropy of physical systems.... I don't think I have to explain it to you any further.